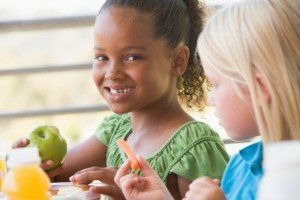 Just because school is out doesn’t mean you can take a break from lunch-making duty—especially if your child goes to day camp. For many parents, the biggest challenge is getting their child to eat their veggies instead of tossing them in the garbage or giving them away. • Fill plastic containers with pasta, tomatoes, diced peppers, onions and broccoli. Add Parmesan cheese and salad dressing (perhaps Ranch), then shake and eat. • Serve zucchini or pumpkin bread. • Create vegetable kabobs (simple: put cherry tomatoes, zucchini, squash on a stick). • Make a vegetarian sandwich. Spread pesto on two slices of bread, then layer with avocado, tomato and cucumber slices, sprouts and cheese. Other ingredients you could add: grated carrots, sliced bell peppers and lettuce. • Whip up some avocado hummus (puree 1 15-ounce can of chick peas or garbanzo beans; 1 medium avocado, pitted; 1 garlic clove; 2 tablespoons lemon juice; ½ teaspoon kosher salt; ¼ cup olive oil; and 1 tablespoon tahini). Serve with pita bread or chips; cucumber spears; or sugar snap peas.